Delivering an intimate urban park experience to more than 200,000 visitors annually, Greenacre Park provides innumerable moments of welcome tranquility and escape for residents, families, visitors, and members of the local workforce. 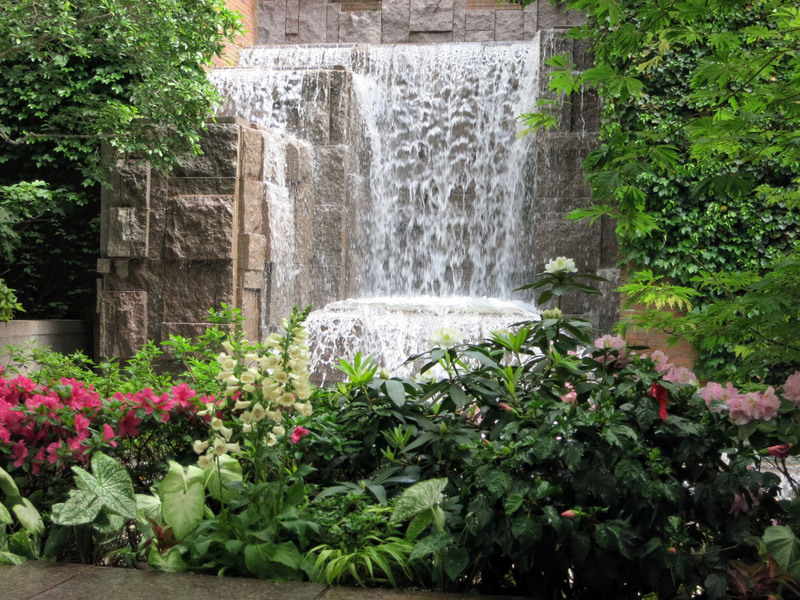 The Park, composed of three levels, is highlighted by a dramatic, 25-foot-high waterfall constructed from huge sculpted granite blocks with a mass of falling water. Water also trickles down a granite-faced wall that flows into a serene brook running along to the Park’s entrance. Open to the sky, the peaceful milieu features a central area of twelve mature honey locust trees, russet brick paving, sunny seating areas with moveable tables and chairs, and an outdoor café. A raised terrace, protected by a trellis roof of weathering steel beams and transparent acrylic vaults, contains heating elements to warm visitors during the cooler months. Lush evergreen plantings, walls of ivy, and large urns of colorful seasonal flowers complete the Park’s restful, garden-like setting. Greenacre Park has been placed on the National Register of Historic Places by the United States Department of the Interior. The Park has received a number of awards for its exceptional concept and design. The Parks Council of New York City, The New York Society of Architects, and The New York State Association of Architects are among the professional organizations that have honored the park’s distinctive contributions to contemporary Manhattan life. Designed by Hideo Sasaki, Greenacre Park — opened in 1971 — was conceived and developed by Greenacre Foundation, which privately owns and maintains the popular site. Greenacre Foundation was founded by Abby Rockefeller Mauzé. Attendants are on duty at all times to assist visitors and to ensure that park rules are observed. The park is closed on Memorial Day, Labor Day, and Thanksgiving Day. 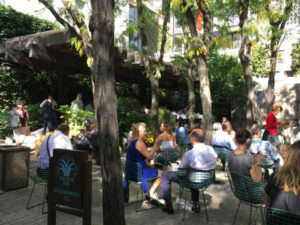 Greenacre Park is privately owned and privately maintained by Greenacre Foundation for all the people of New York City to enjoy. Any activity which, in the opinion of the staff, disrupts the serenity of the park, is not allowed. Smoking, including electronic cigarettes, is prohibited. Tripods and light shades are not allowed. Private events are not allowed. Bicycles, scooters, and skateboards are prohibited. No playing of musical instruments or other audio sources.